Holy cow have I been busy! Between school and work, I am now a catering production cook for Whole Foods in Boulder, I have not had any time to cook for myself, let alone photograph recipes! I am learning so much between school and work, but I could really use some down time; there are just not enough hours in the day. One thing that has made me a bit more cheerful is the fact that it SNOWED here in Colorado last week!! The ski resorts are starting to all open and I finally get to go snowboarding for the first time after my winter in Hawaii, I can't wait! I don't know about you but with snow comes my craving for hot food. I am finally feeling comfortable experimenting in the kitchen with recipes and they are finally coming out blog-worthy! Woohoo! That means more unique and exciting recipes for you all, even if it may take me a good minute to get them posted. =) I'm sure I have many foodie friends that share my addiction for chicken wings. I can't get enough of them. Unfortunately, we can't eat chicken wings for every meal, so my temptations urged me to create a healthier alternative, and not to mention one that is pretty enough to be served at a dinner party! Behold, my crispy baked chicken with herb Buffalo sauce. 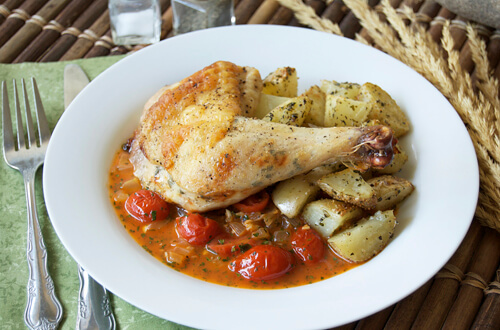 This recipe is a great money saver too if you buy a whole chicken, only about $5!, and break it down yourself. You can see my tutorial on how to do this in my last post: Fabricating a Whole Chicken (A How-To). 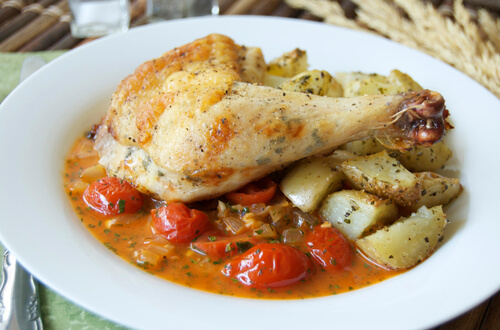 This recipe is great served with Oven Roasted Potatoes, recipe here. Combine 1 tbsp minced parsley and 1 tbsp minced thyme and rub evenly under the skin of each piece of chicken. Season the outside of each piece with salt and pepper. Bake at 400F until cooked through (165F internal temp), about 20-30 minutes. Meanwhile, for the sauce, heat the butter in a medium saucepan. Add the onions and garlic; saute until tender (3 min). Add the cherry tomatoes and 1 tbsp each of the parsley and thyme. Toss with veggies and saute until tomatoes begin to soften (3 min). Add 1 cup Buffalo sauce and toss. Add ½ cup chicken stock. Bring to a simmer, reduce heat, and let cook an additional 5 minutes. To serve, spoon sauce over plate and top with crispy chicken. Serve with oven roasted potatoes (see post for recipe link). This sauce looks amazing! I love buffalo flavored anything!! amout of hot sauce you can get. Hope this helps you out.